Crowns are full-coverage restorations, used to cover a tooth that is either likely to break or is too broken down to be restored with a filling. They are most commonly done after root canal treatment, when a large filling wears out, or when a tooth fractures. 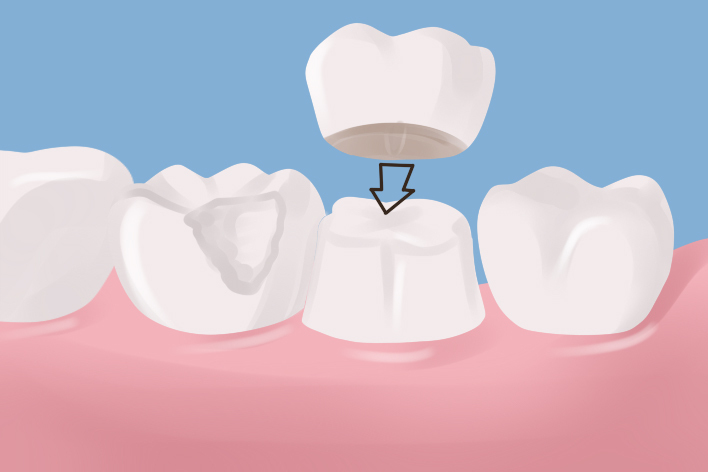 The larger the hole made by a cavity, the more likely a crown will be needed. Even after a filling is put in a large cavity, a tooth is more likely to break. Keep in mind that the jaw muscles are the strongest in the human body. Teeth are subjected to tremendous pressures. Crowns are placed over the weakened tooth, providing strength and protecting the tooth against breakage. A broken or cracked tooth is a far more serious matter and is much more difficult to treat than a simple cavity. It takes two appointments to restore a tooth with a crown. During the first appointment all the decay is removed from the tooth and it is shaped to accept the crown. Then, an impression is made of the tooth for use in fabricating a crown. Between the two visits the crown is made, usually of high-strength porcelain over gold alloy, all ceramic material, or gold. During this time, a temporary crown is worn. At the second visit, this temporary is removed, the long-term crown is adjusted as needed, and cemented in place. Contact us at Advanced Oakdale dental for high quality Dental Crown Services in Dedham. Use our quick contact form or call us at (781) 326-0026 for appointments. Our office is located on 244 River St in the heart of Oakdale Square.